On March 23, the first emissions permit from China’s new Ministry of Ecological Environment (MEE) was issued by the local environmental protection bureau of Baoding in Hebei Province. As shown on the new permit, the Ministry’s logo had changed from ZHB (Zhongguo huanbao, literally, Chinese environmental protection) to MEE, indicating that the reformed ministry was officially in operation. The MEE was just one of the ministries on the long list of government departments to be restructured under new reforms. After axing 15 government departments and revamping the others, China’s State Council now consists of 26 ministries and commissions aside from the General Office of the State Council. The reform has spread to the Party’s organs, the NPC (China’s highest legislative organ), the CPPCC (China’s highest political consulting organ), and the departments under them. Although some of the implementation plans have not yet been detailed or made public, analysts believe that based on what has already taken place, the latest institutional restructuring is the deepest and the most far-sighted of the past decades, covering nearly every government and Party department and focusing on streamlining and integrating government functions, rather than purely downsizing them as previous reforms had done. “Although ecology and the environment are two different concepts, they compliment and influence each other, and it is [more] logical one single ministry does the work of both,” Huang said at a group discussion during the two sessions, China’s top legislative meetings that were held in March. In addition to its old functions, the MEE will take on around 10 more responsibilities, including responding to climate change, emissions reduction, groundwater pollution controls and zoning for water use. These were once scattered between other ministries. 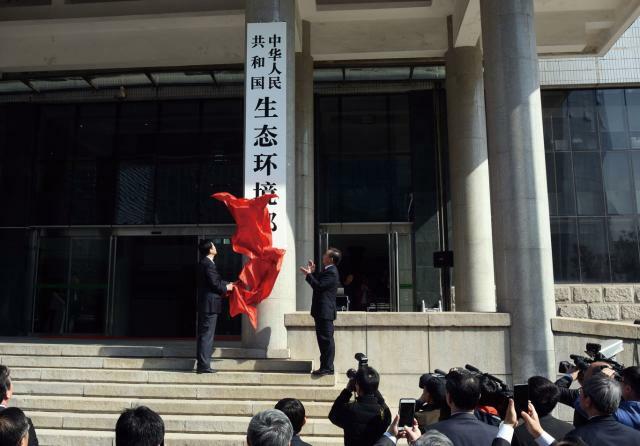 “It is an upgraded version of the ministry,” said Ma Jun, director of the Institute of Public & Environmental Affairs, a non-profit environmental research organization. “It is of great significance that the MEE has broken through previous obstructions from other departments whose responsibilities somewhat overlapped with the former MEP,” he told NewsChina. The MEE is not the only ministry with substantially expanded functions. The new Ministry of Natural Resources (MNR) replaces the former Ministry of Land and Resources, State Oceanic Administration, and National Administration of Surveying, Mapping and Geoinformation, as well as integrating some functions of five other ministries. The MNR will manage all of China’s natural resources, including water, grasslands, forestry, wetlands, oceans and more. Crucially, it will also take over responsibility for zoning and urban and rural construction planning. These duties were previously performed by the National Development and the Reform Commission and the Ministry of Housing and Urban-Rural Development. “It [the MNR] will be a powerful department that helps clarify the users of types of natural resources, removes planning overlaps and gives integral protection to natural resources,” Niu Xiong, a deputy researcher of natural resources and the environment at the Development Research Center of the State Council, told NewsChina. Judging by the MEE and MNR, it’s clear that a major purpose of the latest restructuring is to remove and streamline overlapping functions. The State Council’s previous seven reforms focused on slimming down departments and cutting staff – the number of State Council ministries and commissions dropped from 100 at the end of the 1970s to 25, while the latest reform, according to Xue Lan, dean of public policy and management at Tsinghua University, is concentrating more efforts on integrating functions across industries. “The previous reforms marked off government management by industry, meaning the responsibilities were defined and classified by industry, while in the latest reform, ‘integral function’ is the criterion for classification,” Xue told NewsChina. The best example is the Ministry of Emergency Management (MEM). The new department was established to integrate emergency tasks and services. In the past, accidents or disasters in China were dealt with by different departments based on their nature. A mine accident or a chemical explosion was handled by the former State Administration of Work Safety, emergency earthquake response fell under the jurisdiction of the China Earthquake Administration, geological disasters went to the former Ministry of Land and Resources, and floods and droughts to the Ministry of Water Resources. The Ministry of Civil Affairs distributed rescue and relief materials. Every time a serious accident or disaster occurred, the central government had to set up a higher-level temporary office to coordinate those departments, and worse, the overlapping efforts caused doubling-up – each of the departments had to establish a rescue system of its own. The MEM concentrates and integrates all those functions and serves as a permanent coordinator to prevent disorganized management by multiple departments. “The MEM takes on both routine and emergency management, which will facilitate better resource distribution and make disaster relief more professional and efficient,” Gong Weibin, deputy director of the China Society of Emergency Management, told NewsChina. In the same way, the former National Health and Family Planning Commission and the State Council’s office for the leadership group of deepening health and medical reforms were disbanded to set up the new National Health Commission, which unifies medical and health oversight, as well as senior support and tobacco control. The new State Administration of Market Supervision and Management will unify industrial and commerce management, quality control and drug supervision, the functions of which were once scattered among three departments. Notably, the National Development and Reform Commission (NDRC), once dubbed a “small State Council” for taking charge of developing and approving planning and programs in all sorts of fields, was massively downsized in this round of reforms, with the lion’s share of its work transferred to other departments. “The [latest] reform has squeezed out the NDRC’s functions that overlap with those of the other departments... In the future, the NDRC will focus more on macro-control, while reducing its interference in micro-issues,” said Wang Yukai, a professor at the Chinese Academy of Governance. In his recent article for the People’s Daily, the newly elected Deputy Premier Liu He claimed that “being scientific” is one of the features of the ongoing reform, which he defined as “a top-down flat management model.” Under such a model, he said, one issue or category of issues is handled by a single department, in cooperation with others. With such objectives, the government is apparently adapting to the needs of a rapidly developing and rising country. For example, the establishment of the National International Development Cooperation Agency (NIDCA) and the National Immigration Administration (NIA) shows China is building itself into a “responsible, big” nation as expected. “The establishment of the two new departments proves the government’s administrative services have reached a deeper and further level,” said Zhang Ji, deputy director of the CPC Central Committee’s policy research office, during the two sessions. According to China’s Foreign Aid (2014), a report issued by the State Council in July 2014, China provided nearly 90 billion yuan (US$13.8b) in foreign aid to developing countries from 2010 to 2012. The government has pledged this figure will continue to rise. However, China’s foreign aid management has remained fragmented and disorganized, which slowed efficiency and held China back from gaining broader discursive power on this issue. According to State Councilor Wang Yong, the NIDCA was established to solve this problem by promoting a “three-dimensional foreign-aid model” with the government, enterprises and social organizations working and cooperating with each other under China’s Belt and Road Initiative. Similarly, the NIA was set up to better serve the growing amount of foreign talent pouring into China. According to Wang Huiyao, the director-general of the Center for China and Globalization, establishing the NIA signals that China will be more open and inclusive to globalization. In his article, Liu He emphasized that government departments must be capable of resolving prominent contradictions and controlling potential major risks. This explains the merging of the China Banking Regulatory Commission (CBRC) and the China Insurance Regulatory Commission (CIRC), given that Chinese insurance companies and banks were increasingly risking China’s financial system by launching complicated, non-transparent financial products. “In the reform, the People’s Bank of China [PBoC, China’s central bank] was intended to take over the job of working out and reviewing [financial] regulation,” said Wang Jun, chief economist of the Henan-based Zhong Yuan Bank. “In the future, the PBoC will take on more macro-level issues and micro-market supervision and investor protection will be under the control of the new CBRC,” he added. The anonymous official “Xuanyan” wrote in the commentary that during the reform process, the government is prioritizing the people. In a bid to better serve the people, government departments have to “shift from a quantity-centered management model to one centered on quality one.” This impulse is reflected in the newly established departments, such as the Ministry of Agriculture and Rural Affairs, the MEE, and the MEM. Among the 15 new departments, the Ministry of Veterans Affairs (MVA) has received the most attention for being set up at a high level and taking over a number of functions from the CPC. According to the reform program, the MVA will take over some responsibilities from the political and logistics sections of the Central Military Commission under the CPC, which suggests the latest institutional reforms will not be concentrated only within the State Council. “Given that China is led and guided by the CPC, reforms will never have their intended effect if they do not reach the Party as well,” Zheng Yongnian, director of the East Asian Institute, at the National University of Singapore, told Singapore-based paper Lianhe Zaobao. Following the restructuring of the State Council, the CPC central committee issued another program on deepening reform of the government and Party departments, announcing it would upgrade four of the Party’s “leadership groups” – those on economics and finance, network security, foreign affairs and reform deepening – to the commission level. According to the program, the upgrade aims to strengthen the leadership of the Party by empowering the commissions to do top-level design and make general arrangements and supervision of major issues. “As the ruling Party, the CPC exerts its leadership generally by the administrative power of the government. However, the leadership was somewhat weakened by separating government administration from society and companies, which has been implemented in recent years,” Mao Shoulong, the executive president of the Public Policy Center, at the Renmin University of China, told NewsChina. “Given China’s political system, we must organize and coordinate reforms in both the government and the Party departments and organs, or the reforms will neither be ‘thorough’ nor ‘deep,’” he added. That is why Liu He emphasized that the latest reform should be “all-round.” “Different from previous reforms, the latest institutional reform should cover all fields, including the Party, the government, the NPC, the CPPCC, law enforcement organs, social organizations, the military organs, local government departments and so on... The reform should ensure the centralized and unified leadership [of the Party], while giving more autonomy to provincial and lower-level departments,” he said.